Boyle Heights resident David Gomez leads a group of runners across the 4th Street bridge from Boyle Heights to downtown L.A. on a recent Wednesday night. He runs up and down the streets alongside the group to make sure all are safe. He alerts everyone of the route: a right on Alameda and a right onto the 1st Street bridge. 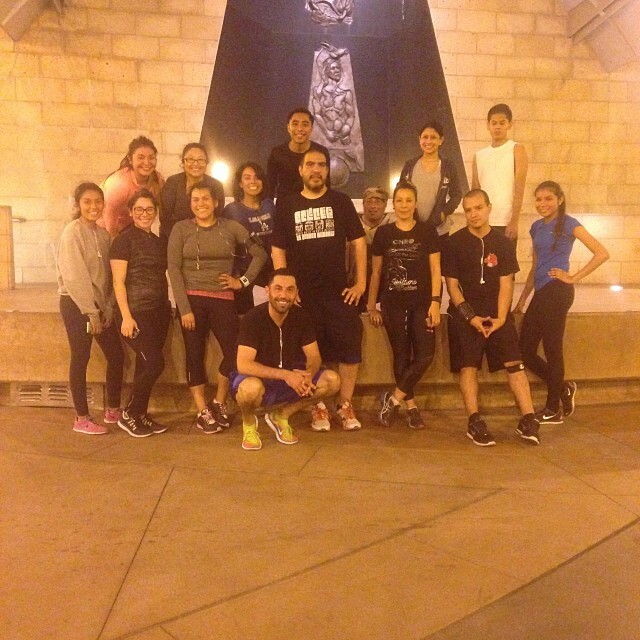 They call themselves the Boyle Heights Bridge Runners, and they meet weekly for a three-mile run which begins near Mariachi Plaza. “You have to create your own spaces. 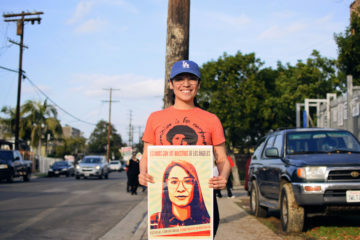 So within Boyle Heights”¦we have all these freeways here and we have everything stacked against us and it’s up to us to create something out of it,” says Gomez. Gomez started running a few years ago in a group based out of Pasadena. He says he began running one minute and walking five minutes, eventually running five minutes and walking one minute. 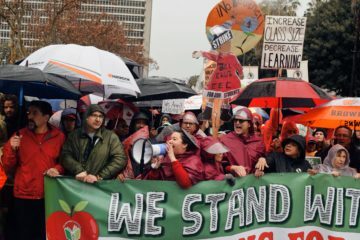 He noticed running groups were popular in affluent areas like Pasadena and Santa Monica, where the community was already conducive to a healthy lifestyle. 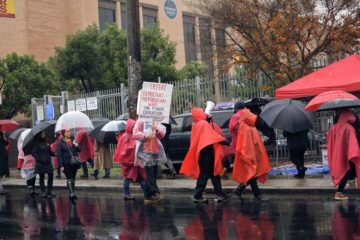 That’s when he and Elisa Sol Garcia, both part of the founding collective behind Espacio 1839, realized the need for a health-oriented group in Boyle Heights. Garcia and Gomez started the group about a year ago to encourage people in the community to get their health on track. “I thought it would be cool to get a group of us and start running around Boyle Heights””kind of an appreciation of the city as well. And also, it helps that people live around here and don’t have to drive somewhere else to join another running group,” says Gomez. Working at Espacio 1839, Gomez says he gets people coming into the store asking for t-shirts in abnormally large sizes and wonders if they’ve given up on health and are comfortable with themselves. “It’s not just about running, it’s about building a community based on something healthy””something life-changing,” says Gomez. 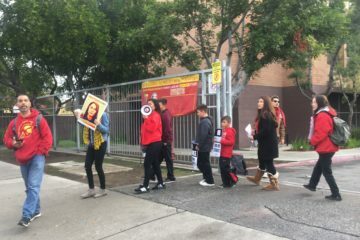 About five to 15 runners, mostly nearby residents, students and teachers from Roosevelt and Garfield high schools make up the group. Some are not experienced runners; others have run marathons and share different tips and techniques for running. “I never thought about running a marathon. This time, we are going to run the L.A. Marathon and that comes from talking to other people who are in the group that have ran marathons before and have done 10Ks. They’re like, ‘you can do it,’ ” says Gomez. Gomez and Garcia encourage runners of all levels. “I like this route because it’s three miles. It’s a good workout for somebody who’s advanced because it’s got those inclines. It’s also not that long for someone who is starting out,” says Gomez. 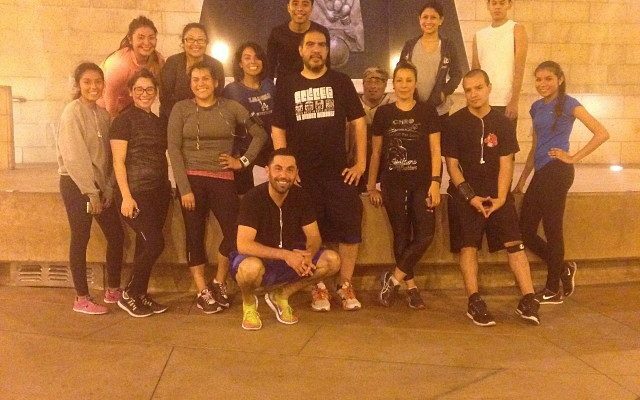 The Boyle Heights Bridge Runners meet at 7:45 p.m. every Wednesday at 1839 E 1st Street, outside Espacio 1839. They conduct a stretching session before their run begins at 8 p.m. The group makes a left onto Boyle from 1st Street, runs down 4th Street over the bridge into the Arts District, makes a right onto Alameda, then another right onto 1st Street back over the 1st Street bridge to Mariachi Plaza. Hola Genoveva, el grupo se reúne a las 7:45 en la tienda Espacio 1839 casi al lado de la Plaza del Mariachi. No hay quota ni es necesario inscribirse.